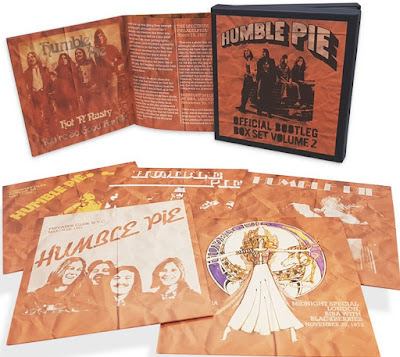 Following up on 2017’s “Official Bootleg Box Set 1” drummer Jerry Shirley has compiled a five CD box set of live recordings by Humble Pie, featuring performances from 1971 through 1981. The collection begins with one of the first gigs to feature guitarist Clem Clempson and ends with a soundboard tap of the band recorded just a couple of months before the band broke up for the second time in July, 1981. Disc one of the set features a December 3, 1971, concert recorded at New York City’s Academy Of Music, and was indeed one of the first appearances by former Colossseum lead guitarist Clem Clempson, who was selected to replace founding member, guitarist/vocalist/songwriter Peter Frampton. The eight tracks include staples from the group’s live repertoire, “Four Day Creeper,” “C’mon Everybody,” “Hallelujah (I love Her So)” and “I Don’t Need No Doctor” mixed with three tunes from Clempson’s Humble Pie debut 1972 LP “Smokin’” namely “The Fixer,” “I Wonder” and “Sweet Peace And Time” as well as an eighteen minute cover of Muddy Water’s “Rollin’ Stone.” The band’s set is memorable for Clempson’s guitar work. On “The Fixer” for instance, the new lead guitarist delivers tasty wah wah work and a stunning solo. “I Wonder” a slower blues tune, spotlights Clempson’s lead line as well as another memorable solo. “Sweet Peace And Time” brings Deep Purple to mind, and rocks hard with Clempson’s lead guitar to the fore. Clempson’s performances are incredibly competent and made the transition from the Frampton years seamless, as evidenced by the fifty nine minutes found here. The third disc is split into two parts, the first comprising four tunes from a March 15, 1975 show at the Spectrum in Philadelphia, and the second a three song set played in front of a specially selected audience at the Biba fashion store in London, recorded for the US television show “Midnight Special” with the band, introduced by Procol Harum’s Gary Brooker, appearing with The Blackberries (Clydie King, Vanetta Fields and Billie Barnum) providing backing vocals and reinforcing the band’s reputation as master R&B artists. The tracks included from The Philadelphia show include a nearly nine minute take on “Stone Cold Fever” written by the original quartet of Steve Marriott, Peter Frampton, Greg Ridley and Jerry Shirley, with Clempson’s wah wah performance and killer solo doing the tune, originally released on “Rock On” justice indeed. The three song “Midnight Special” set includes a rollicking five minute run through of the R & B classic “Oh-La-De-Da” given special heaviness by the quartet. Following an eight and a half minute version of live staple “I Don’t Need No Doctor” the Pie add their special touch to an extended, eight minute plus, romp through their signature song “30 Days In The Hole” which debuted on “Smokin’,’ by quoting Sly & The Family Stone’s “Higher” to open the track. Following the split of July, 1975, Humble Pie reformed with Marriott and Shirley being joined by ex-Jeff Beck Group guitarist/vocalist Bob Tench and bassist/vocalist Anthony “Sooty” Jones. It is this group, Humble Pie Mk. III, that is featured on discs four and five of this set. The fourth disc is a March, 1981 concert from the Privates Club in New York City. The band had its gear stolen just before this gig, and as Jerry Shirley points out in the liner notes to this box set, that fact had a big influence on their performance that night. Following their introduction and a spirited take on “I Don’t Need No Doctor” the group rocked its way through “Infatuation” a track from their 1980 LP “On To Victory.” The song is highlighted by Bob Tench’s massive lead guitar and solo as well as Marriott’s guttural R&B vocals. The group was touring their 1981 LP “Go For The Throat” which included a cover of the Otis Blackwell/Elvis Presley penned “All Shook Up,” a tune well suited to Marriott’s vocal style and revved up by Tench’s guitar work. Jerry Shirley, who like Keith Moon, was not a fan of drums solos, was so upset at the loss of his Ludwig kit, that he performed a nearly three minute stand alone solo on top of his extended intro to “I Don’t Need No Doctor.” The seventy three minute performance featured here is dominated by the nearly twenty four minute medley of the group’s signature tune “30 Days In The Hole” which around the sixteen minute mark segues into the often covered Dr. John classic “I Walk On Guilded Splinters.” Tench’s guitar shines throughout as he contributes inspired lead guitar and solos to the track. The medley reverts back to “30 Days In The Hole” as Tench’s guitar drives things home. At Shirley’s suggestion the band recorded “Tin Soldier” a standout track from Marriott’s days with Small Faces, and the group adds heaviness to their performance of the tune which entered the band’s live repertoire at this point. A seven minute take on “Fool For A Pretty Face” a Shirley/Marriott composition from “On To Victory” is once again dominated by Tench’s guitar. The show closer is a fourteen minute medley of the oft covered “Route 66” combined with “Tulsa Time” a tune Marriott loved dearly and the Gene vincent chestnut “Be-Bop-A-Lula.” Tench’s guitar is at the fore and his blistering outro is the highlight of this performance. 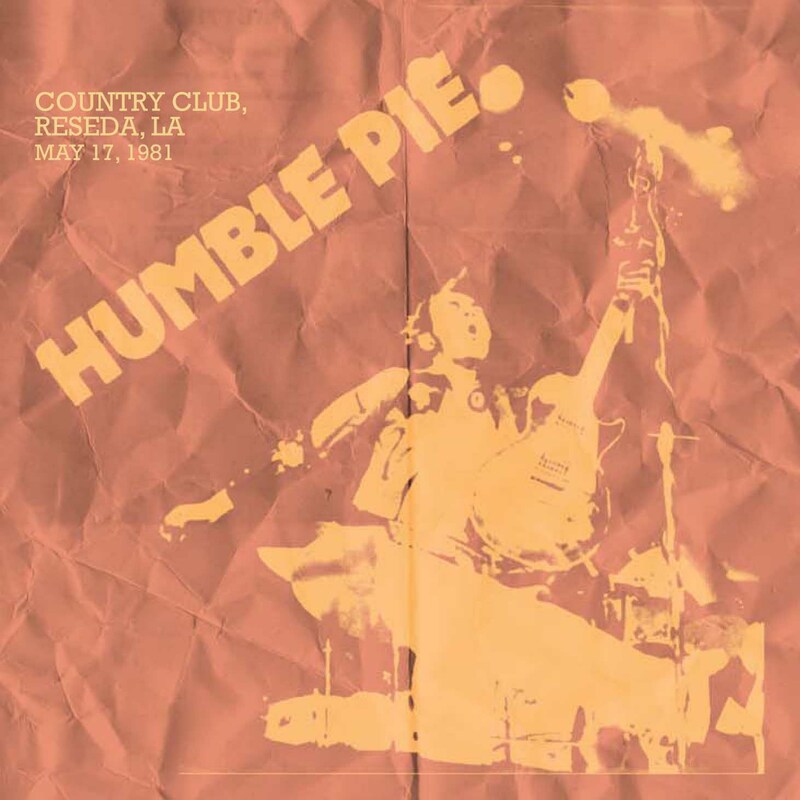 The final disc contains a May 17, 1981, soundboard tap from a show at Los Angeles’ Country Club, recorded just a couple of months before the band once again disbanded in July. The set list is almost a carbon copy of the Privates Club show. Once again Bob Tench’s guitar drives the band. Sadly, Steve Marriott had become ill in Texas prior to this gig and although he braves his way through the show his numerous references to snorting cocaine, smoking grass and drinking Jack Daniels give the listener an insight as to how he was able to do so. The show definitely has its highlights though. A ten minute take on “30 Days In The Hole” contains a crisp drum intro by Shirley and luscious guitar courtesy of Tench. An extended, nearly five minute, take on “Tin Soldier” finds Marriott sounding much more like his days in Small Faces than the recording from New York City. The set, gig and box set end on a high note with the band breaking up the medley with individual offerings of “Route 66,’ “Be-Bop-A-Lula” and a particularly energetic version of “Tulsa Time” featuring a smoking guitar intro by Tench, whose guitar shines once again and Steve Marriott’s vocals, especially on the show closer is indicative of how much he really loved this tune and it is absolutely the perfect show closer. “Official Bootleg Box Set Volume 2” comes in a clamshell box, complete with a full color 16-page booklet which includes lots of gorgeous photos and essays by Malcolm Dome and Ian McGonigal. The sound, admittedly not audiophile quality considering the sources, is outstanding however, thanks to the fine mastering job by Tony Dixon. 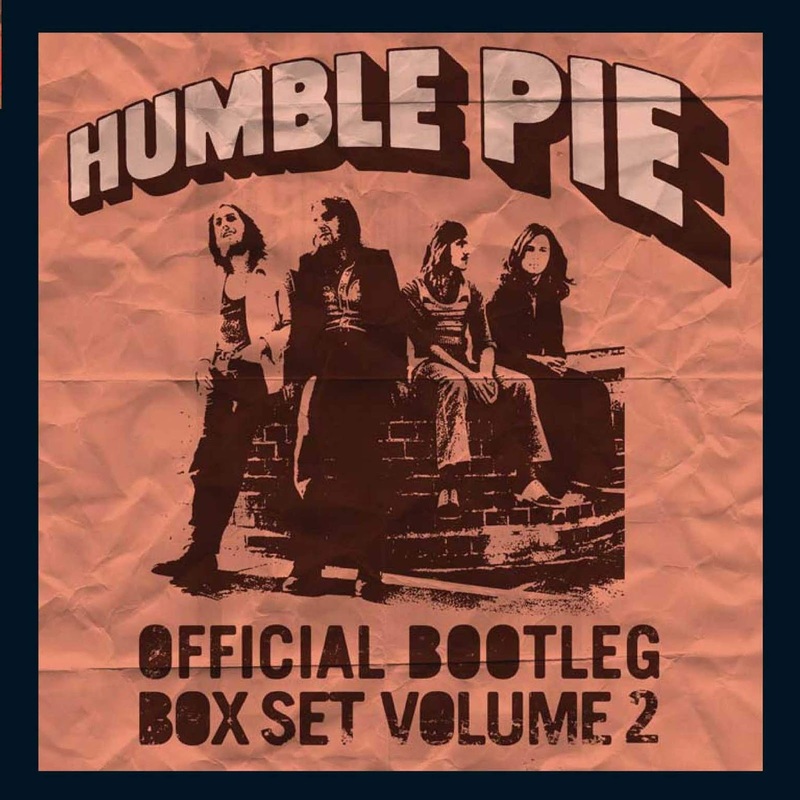 The set, produced by drummer Shirley is highly recommended for Humble Pie fans and for those interested in the evolution of one of the UK’s best R&B influenced rock bands of the 60’s, 70’s and 80’s.